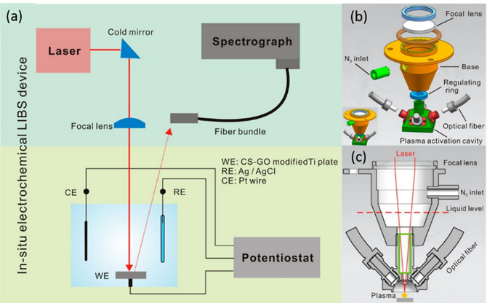 A Chinese study team released a review where they primarily described the recent advances of representative electrochemical spectral methods and their applications. The work was conducted by Prof. HUANG Xingjiu’s team in Institute of Intelligent Machines (IIM), Hefei Institutes of Physical Science and was published on Trends in Analytical Chemistry. The contamination by heavy metal ions (HMIs) captures increasing attention, for the threats it poses to ecological system and human health. In these few years, electrochemical spectral methods have stepped into the research hotspots for its application to trace detection of HMIs, with advantages of super low detection limits, great sensitivity and anti-interference. Through the review, the team pointed out that electrodeposition has become an effective mean for the preconcentration of HMIs ahead of atomic absorption spectrometry (AAS), total reflection X-ray fluorescence and X-ray fluorescence (TXRF/XRF) and laser-induced breakdown spectroscopy (LIBS), and electroadsorption also has been used as a preliminary procedure for XRF, LIBS, on the basis of electrostatic force. Furthermore, these electrochemical spectral methods were demonstrated to be capable of the in-situ detection of target HMIs, providing a good alternative for the daily environmental monitoring for HMIs. Based on the overview of these methods, they also addressed up-to-date challenges of in-situ electrochemical spectral methods, for which further researches are needed. Figure 1. Experimental apparatus of in-situ underwater EA-LIBS device. (a) schematic of EA-LIBS device, (b) deconstructed arrangement, (c) sectional view of the gas-assisted localized liquid discharge setup. (Imaged by JIANG Tianjia).